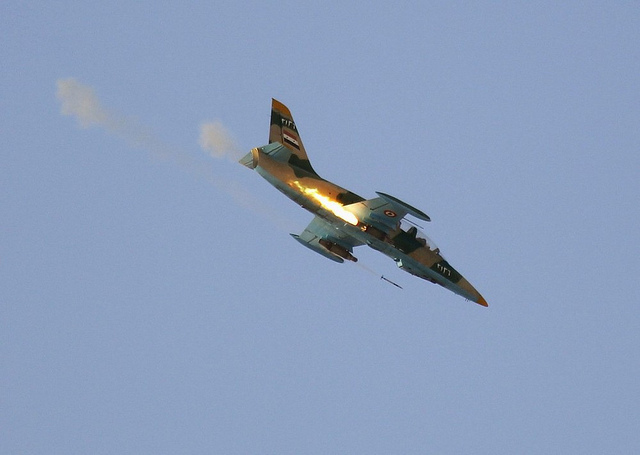 A Syrian Air Force fighter plane fires a rocket during an air strike in 2012 (Flickr user a.anis). Background: Legislative Decree No. 18 of 2018, which grants general amnesty to certain individuals accused of deserting or avoiding military service, was issued on October 9, 2018, by President Bashar al-Assad. Summary: Legislative Decree No. 18 grants general amnesty for the crimes of army desertion or avoiding military service per Articles 100 and 101 of Legislative Decree No. 61 of 1950 (Penal Code and Essence of Military Trials) and its amendments, and for the crimes detailed in Legislative Decree No. 30 of 2007 (Flag Service Law) and its amendments. To qualify for amnesty for violations of Decree No. 61 of 1950, fugitives must turn themselves in within four months if they are inside the country or within six months if they are outside of it. The amnesty for violations of Decree No. 30 of 2007 does not include fines intended to be a “civil compensation” to the state. Individuals who turn themselves in and are granted amnesty for previous desertion or draft dodging will still be expected to complete their military conscription in accordance with the law. Significance: While Legislative Decree No. 18 does provide respite for some individuals who have fled military conscription or deserted the army, its impact in ushering in the return of a significant number of refugees is likely to be narrow. The amnesty will not protect those who have fought against the Syrian regime as they are considered by the government to be “terrorists.” Additionally, the measure only covers the crimes of army desertion or avoidance of military service; thus, an individual who, for example, faces charges of army desertion, illegal protesting, and terrorism could turn himself in and still have to answer for the illegal protesting and terrorism charges. Finally, in light of increasing reports that individuals who have been signing reconciliation agreements with the Syrian regime have been tortured, detained, or even killed despite their commitment to these agreements, it is very likely that many—particularly those who consider themselves dissidents—may not trust the Syrian regime to honor its promise of amnesty. Legal Context: Article 46 of the Syrian Constitution states that “compulsory military service shall be a sacred duty” and that “defending the territorial integrity of the homeland and maintaining the secrets of state shall be a duty of every citizen.” Under Syrian law, military service is compulsory for all men over the age of 18; while women are not required to serve, they do have the option to enlist voluntarily in military service. Certain legal provisions do allow the postponement of or exemption from military service, though a 2017 change in law has made it more difficult for university students to continue deferring their conscription. In some cases, an exemption fee can be paid; however, depending on the category of the individual seeking exemption, it may be quite costly. Men who fail to submit themselves to military service or who desert their military service face jail time. Legislative Decree No. 18 is not the first amnesty that the Syrian regime has issued since the beginning of the war; amnesties have been announced on multiple occasions, including in 2014, 2015, and 2016. Political Context: As the war in Syria has continued, the Syrian regime has lost many of its soldiers to mass casualties, desertion, draft dodging, and defection. It has taken a number of steps to make up for its gutted military, including keeping some conscripts in the army despite the completion of their legally mandated 18-month service, calling in reservists who have previously completed and satisfied their military conscription, raiding homes in order to find individuals to forcibly conscript, setting up checkpoints across the country to catch those avoiding conscription, issuing numerous iterations of amnesties to entice deserters and draft dodgers to return without fear of prosecution, and releasing propaganda—including a March 2018 video titled “Braids of Fire,” which spotlights voluntary female conscripts in an attempt to “shame” men into enlisting. Although some men have fled the country or avoided military conscription simply because they do not want to fight in a war in which their lives may be at stake, others have defected from the army or avoided military service out of political conviction and in opposition to the Syrian regime. At times, family members of draft dodgers and deserters have faced retaliation by the Syrian regime in the form of pressure and arrest. Adherence to Legal Norms: With many Syrians hesitant or unwilling to join a military that has engaged in attacks against fellow citizens, at least a proportion of draft dodgers or deserters may be considered conscientious objectors. While Syria’s constitution and its international legal obligations do not explicitly recognize a right to conscientious objection, they do protect the right to freedom of thought, conscience, and religion—from which conscientious objection has been argued to be a derivative right. A compulsory military conscription scheme in which individuals may find themselves forced to serve without alternative and in egregious extension of even the domestically established maximum time period for conscription likely occurs in violation of this right. Additionally, although an amnesty is meant to provide respite for individuals considered to be draft dodgers or deserters, Legislative Decree No. 18 sets forth an amnesty that is not available for all individuals, as it leaves out persons who oppose the Syrian regime, thus discriminating on the basis of political opinion and occurring in violation of international law. Implementation: On October 9, 2018, the grace periods of four months for internal escapees and six months for external escapees to turn themselves in began to go into effect. No reporting is available on the number of draft dodgers and deserters who have returned to Syria or are now encouraged to return in the wake of this amnesty. 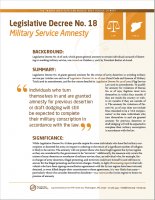 Little reporting is available on previous iterations of amnesties as well; however, some organizations do state that amnesties have not necessarily resulted in the return of refugees or escapees, particularly because such individuals would still be required to satisfy their military service. Text of the Decree: The official text of the decree is available in Arabic here.